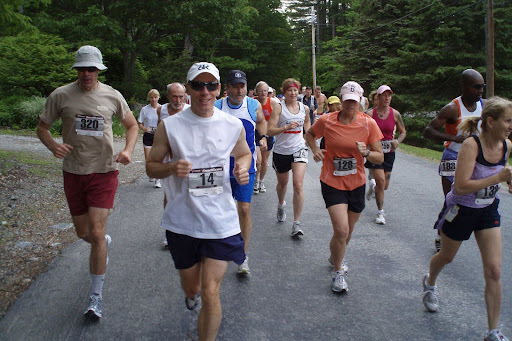 Here are photos I took while running the 2009 Pack Monadnock 10-Miler in Wilton, NH. "Pack" is the 2nd race in the USATF-NE Mountain/Trail Circuit (the “Mountain Goat” Series.) If you run all six races in the series, you get to bypass the Mt. Washington Lottery next year. But it's never the summit. Every turn just takes you to another stretch of road that seems intent on spiralling you right up to the sky. I am probably giving the wrong impression here. The course is beautiful, and the final 1.5-mile climb to the summit of Pack is no big deal. (Certainly nothing like Mt. Washington or Loon.) But that road to the summit comes after 8.5 miles of rolling country roads...so it is TOUGH when you finally reach the mountain and have to dig. My advice? Take it Easy. Treat the first 8.5 miles as a warmup. Don't get carried away. If you wear yourself out before reaching Pack itself, you will regret it.